With the success of doctor-only devices in recent years, plasma has become a hugely popular go-to treatment for non-surgical skin tightening and lifting for conditions such as sagging upper and lower eyelids, loose skin on the lower face and the neck such as jowls and ‘turkey neck’, full and soft-facelifting without surgery, pigmentation removal, small tattoo removal and semi-permanent make up correction, skin tags, stretch marks and skin imperfections. In recent months there has been a surge in new devices coming on to the UK market, many with no track record, a less-than robust training programme and very little ongoing support, not only for the practitioner but for the safety and peace of mind of the consumer. A|C|C|O|R® is different. 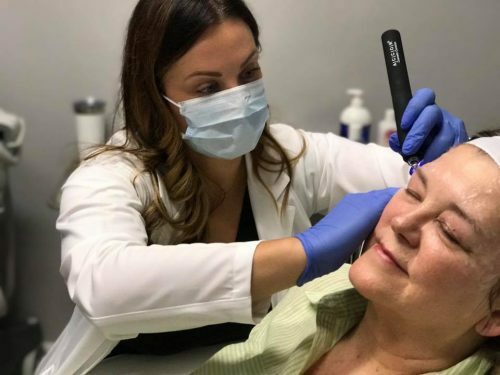 The global number one plasma device, A|C|C|O|R® Cosmetic Corrector is the first Plasma pen to utilise a low frequency delivery of the plasma arc. This enables the treatment imprint to be wider, and shallower than traditional thermal only devices. The benefits of which are a greater tightening effect allowing for better results, a quicker healing process and less down time to the client. With a 5 year proven track record, A|C|C|O|R® have been supplying the German market since 2013 and has established partners across the globe. With 1000s of successful treatments delivered coupled with a commitment to continuous development. Todays A|C|C|O|R® Cosmetic Corrector specialist has the confidence that a team with unrivalled experience is always there to support. A|C|C|O|R® have over 100 UK practitioners, successfully delivering plasma skin tightening and rejuvenation to consumers around the country with stunning results. Established Multi-level Training Program Included. A|C|C|O|R® believe the key to successful treatments is in the skill of the operator. We demand that every A|C|C|O|R® practitioner undergoes a rigorous multi-tiered training and support program. Two days of training are including as standard with every pen, and must be completed to reach A|C|C|O|R® Pro standard. Our dedicated training is delivered on a ONE Trainer, TWO student only ratio and supported with ongoing mentoring and peer review through our closed support network. The cost of the A|C|C|O|R® Cosmetic Corrector and two-stage training module is £5950 + VAT and a 0% finance option is available over 36 months at £43 per week inclusive of VAT. I would like to know if i can do a treatment on the exhibition day and how much ir cost fir my eyeleds and my face and neck please left me know. Hi Elizabeth, Thank you for your message. I am just checking with ACCOR for you.